Extension Master GardenerSM Volunteers of Buncombe County are ready to answer your gardening questions! Beginning March 1, the Garden Helpline will have additional support on Monday and Thursday from 10 a.m. to 2 p.m. through September. 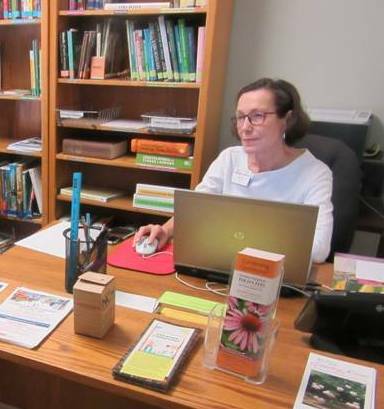 Our Master Gardener volunteers are available for phone calls, walk-ins, and emails. Master Gardener answers Helpline question. Call our Garden Helpline at 828-255-5522 or visit the Extension office at the location shown below. If your call rolls over to voicemail, just leave a message. If you bring a plant sample to the office, please be sure it’s large enough for plant identification. Not sure how to collect a plant sample? Give us a call. You can also email your questions and plant photos to Buncombemg@gmail.com. Each year, Extension Master Gardener volunteers answer hundreds of gardening questions. From October through February, your questions will be answered by Alison Arnold, Extension Agent, Consumer Horticulture. The Extension office and our Helpline are closed on N.C. state holidays. The Extension Master GardenerSM Info Table can also help you with your gardening questions! Volunteers can be found at various Tailgate Markets and at special events throughout Buncombe County from April through September. Wondering where we will be through the season? Just check our events calendar at www.buncombemastergardener.org. Stop by and tell us how your garden is growing! We’re here to help. Please contact us! Announcement written by Pat Strang, Extension Master GardenerSM Volunteer. Children show off their harvest. Students play an active role in many public-school gardens in Asheville and Buncombe County. Depending on the grade level, students help plan their gardens, develop the soil, plant vegetables and flowers, and enjoy the bounty of their efforts. First graders might learn about germination by planting bean seeds, while high schoolers may help create a rain garden to deal with erosion. These school garden projects are so diverse! Some involve the entire school. Others focus on a group of students—such as all the 2nd graders or special-needs kids. Projects range from building and maintaining a vegetable garden—even donating their crops to MANNA Food Bank—to establishing a pollinator garden; researching and cultivating a native plant garden; and much more. We are excited about one school’s greenhouse aquaponics system—among the first in North Carolina! Students participate in classroom lessons and outdoor garden experiences. In the classroom, they learn basic soil science, composting, plant parts, and vermiculture. 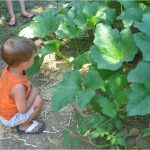 Then they go out to the garden to apply these lessons—digging, pulling weeds, planting, creating a sustainable environment, and getting their hands dirty! They make and record observations about their plants, the weather, and soil samples. They learn about food origins, how vegetables grow, and how they taste; they understand that food does not grow in the grocery store or in a fast-food outlet! They share nutritional knowledge and excitement at home with parents and other family members. 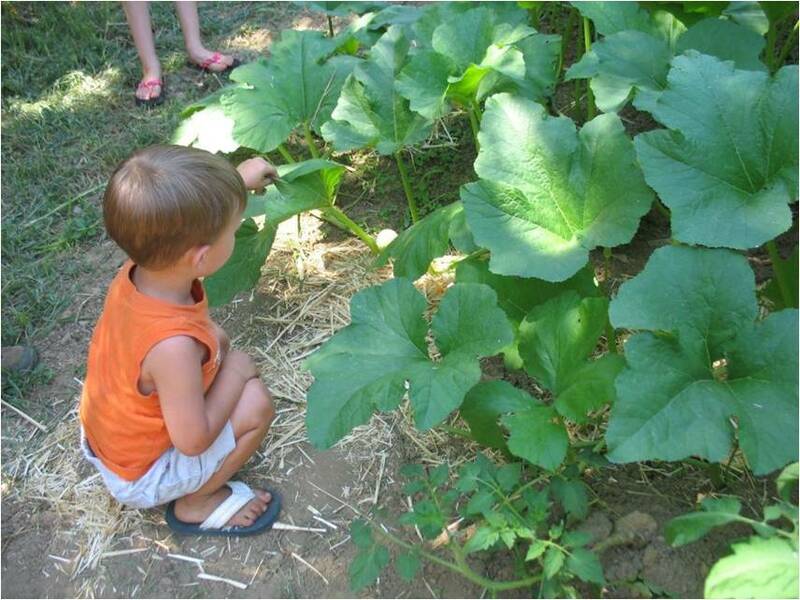 Child examines huge leaves in the school veggie garden. 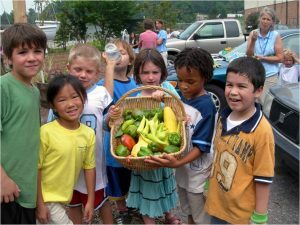 The Extension Master Gardener Volunteers of Buncombe County’s mission is to support, teach, and encourage a diverse community of gardeners using current research-based horticulture practices. 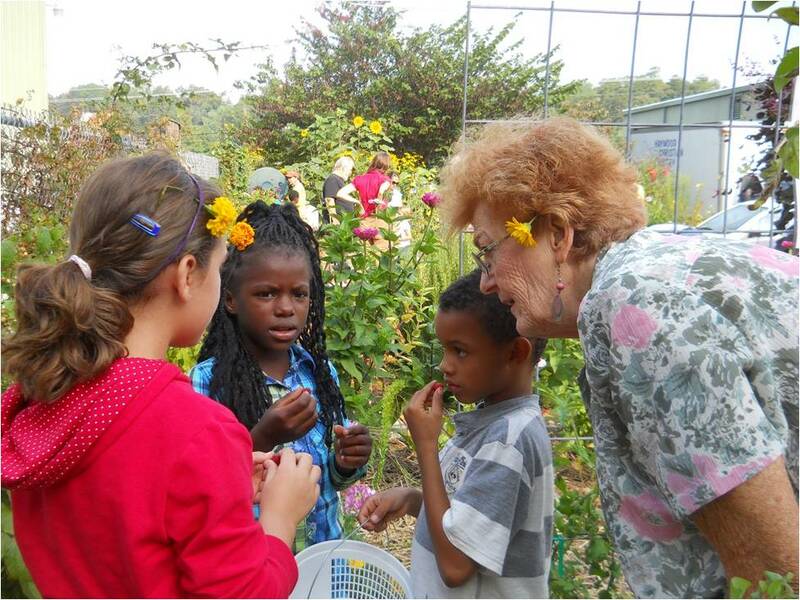 Our School Garden Grants program is designed to educate school children about gardening. We fund the grants—available to all public schools in Asheville and Buncombe County–through a portion of the proceeds from our semi-annual Garden Tour. 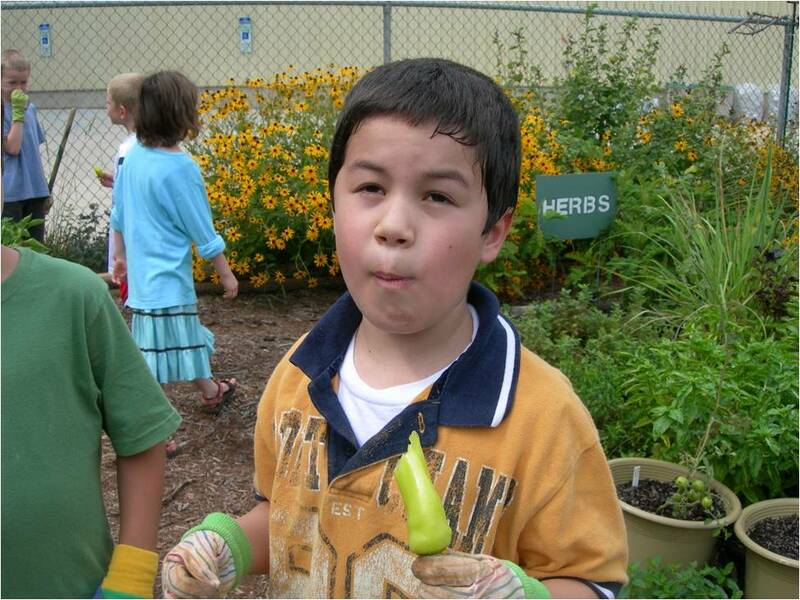 Since 2007 we have awarded 44 school gardens a total of more than $25,000. These grants impact thousands of students in grades K–12, along with hundreds of teachers and community volunteers. The ripple effect is tremendous! 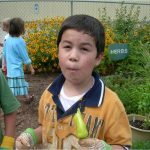 School garden coordinators apply for garden grants by the end of February, asking for a specific amount of money to fund a garden project at their school. The School Garden Grants Committee reviews and evaluates these requests against strict criteria. We fund things like soil amendments and plants, but not tractors! The Committee meets and makes decisions based on our budget, notifies schools, and provides the grant monies by the end of March. At least one Master Gardener volunteer is assigned to each funded school. During the active part of the project, we often work hands-on in the dirt with the kids. This is one of the most fun and gratifying parts for me! The students benefit from learning and working in the garden in many ways. There is practical as well as therapeutic value of playing in the dirt and watching something you’re involved with grow. And it’s fun! See our recent blog, The Living Classroom: Gardens in School Settings.